Hyderabad is known for many things: the Hyderabadi biryani, the paan and the historical sites, but not all of them can be explored if you have only 24 hours to spend in this city. Now the part of a new state called Telangana, Hyderabad beautifully welcomes its visitors. While we had a lot of recommendations for this piece, we wanted to make your day's trip to Hyderabad both delightful and touristy. So we created the below list. The list covers the top 5 things that you can do in Hyderabad if you have only 24 hours here. So there you go... On your next trip, you have this list. Bookmark it right away. For the newbies travelling to Hyderabad, this list will come handy and for those who have been to Hyderabad, scan through the places you've not been to and tick them off on your next trip. Post your exploration, you can head to Golconda Fort for some serious sightseeing. The fort is situated at a height of 390 ft surrounded by battlements. The fort was built by the kings of Kakatiyas as the military foundations to keep enemies away. It was later rebuilt and restructured by Rani Rudrama Devi. The most important element of its historical past and one of the key features that will implore you to visit this place is that the fort once was home to the famous Kohinoor diamond. In fact, the Golconda area was famous for its diamonds and the market known as the Golconda market was famous for diamond merchants bartering their way. Because of its height, the fort overlooks the city and this gives the palace a beautiful view. Apart from its military significance, Golconda was also known for its diamonds. The area brought some of the most beautiful diamonds in the history to the world. This art museum is fancied by many history lovers and not just for its historical significance but for the marvellous architect of the museum as well. Even if you don't like history stuff, you can't help but admire this magnificent piece of architecture. This art museum is housed in Darushifa, near the Musi river. Being one of the three national museums of the country, this place offers an array of beautiful sculptures, paintings, ceramics and carpets, brought here from the corners of the world. It is one of the largest museums in the world. The white-marbled building stands tall and welcomes you smilingly onto its verandah. The historic significance of the palace is that it dates back to the 1st century. Nawab Mir Yousuf Ali Khan spent years and years to create such a beautiful museum with items so unique and priceless. You can also admire the age-old sundials and clock collection in the building. The chains of Birla Mandir can be found throughout the country so if you're a devotee and you have only 24 hours to explore Hyderabad, we recommend you tick off Birla Mandir in Hyderabad as well. The white-marble temple stands atop a hill and proudly welcomes its devotees. Even if you're not religious, you can just go there to check the view from the top of the temple. This is the night market that is hosted near Charminar, close to Old City. The market displays an array of beautiful shops featuring everything from lip-smacking foods to cheap clothes. It is quite lively during the festival of Ramzan but on a regular day, too, it looks quite alive with people hustling in and out of the market. Shopping here is a heavenly experience, in fact, a dream of every shopper because you can bargain your heart out here. 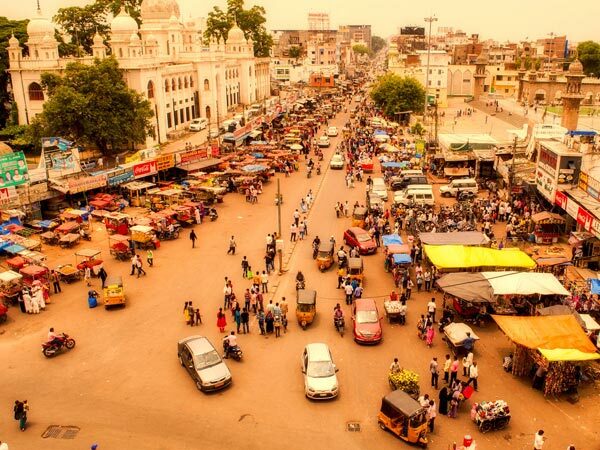 The market is as old as the Charminar so it's not just the shopping that you are taking home. The colourful market showcases a variety of home takeaways but the best ones we'd recommend are bangles; colourful rows of bangles have found their own homes in alleys of this market. They shine, they bling, they lure in the passers-by. Next on the market list are the earrings. It's a perfect place to do a pre-festive shopping of jewellery as the market offers a wide range of faux Kundan jewellery. Another item in the market that you should definitely take away is ittar. What's the point when you have come so far and have not even bought the thing the place is famous for? The last item on the list is slippers. You can pick up as many as you want as these are cheap and durable. Don't expect anything fancy but they'll last long if you treat them well. Talk about our own Statue of Liberty: the Buddha statue right in the middle of Hussain Sagar. Hussain Sagar is a heart-shaped lake spread across an area of 5.7 km. It was built by the ruler Ibrahim Qutb Shah Wali of the Golconda kingdom. The Gautam Buddha's statue was erected in 1992 but it is a treat to the eyes. The statue lights up in the night, lending the Buddha a beautiful fluorescent pink and yellow light. On the second anniversary of Telangana, India's largest flag worth 3 crores was hoisted near Hussain Sagar. If you thought Hyderabad was famous for just its biryani, then you were wrong. Hyderabadis are even known for their bakeries. The delicious Osmania biscuits, the nutty cookies and a variety of sweet desserts will end your 24 hours in Hyderabad with sweet memories.